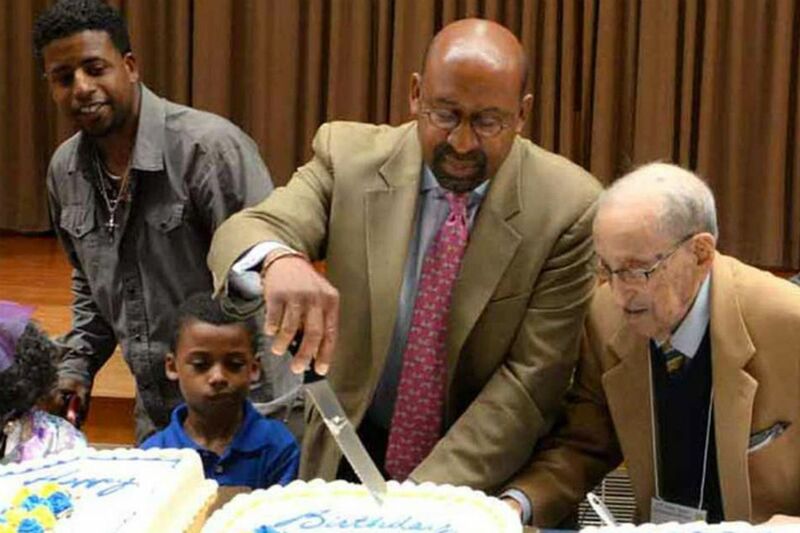 Daniel M. Rendine watches as Mayor Nutter cuts a centenarian cake at a June celebration of seniors in South Philadelphia. Daniel M. Rendine, 105, a longtime Philadelphia lawyer and an avid golfer who once played in a twice-weekly foursome that included the pool legend Willie Mosconi and the newscaster Tom Snyder, died Monday, Dec. 29, of heart failure at Chestnut Hill Hospital. Mr. Rendine, who was the oldest man in attendance when the city honored more than 100 centenarians in June, attributed his longevity to moderation: "I won't turn down a drink, but I won't go overboard with a drink." He served as an assistant city solicitor from 1942 to 1952 and as a special assistant deputy attorney general from 1960 to 1968. He attended baseball games played by Ty Cobb and Babe Ruth. "He led the most amazing life of seeing so many changes, of adapting to all of them, and never losing his perspective," said his son, Jury Commissioner Daniel A. Rendine. "And he did it all with a great love for his family, his profession, his golf, and South Philadelphia." His last words to his son Monday before he died were: "I sure could use a Rob Roy." He was born in Brooklyn, N.Y., one of Cologero and Margaret Misrendino's eight children. His father owned a restaurant in New York, but his family was forced to relocate to South Philadelphia after his father refused to pay tribute to the Black Hand, the Mafia of the time. Mr. Rendine graduated from South Philadelphia High School in 1927. He attended Temple University and earned his law degree in 1936. While attending law school at night during the depths of the Depression, he worked delivering coal and newspapers, and selling shoes. He met his future wife, Teresa Chialastri, through a theatrical group at St. Paul's Catholic Church in Bella Vista. They married in 1942 and their only child was born eight years later. A judge privately advised the young lawyer to change his last name from Misrendino if he wanted a successful career. He shortened it to Rendine. Mr. Rendine stayed close to his roots, serving as chancellor of the Justinian Society of Philadelphia, a group composed of Italian American lawyers, judges, and law students. He also served as chairman of the Philadelphia Human Relations Commission, president of the South Philadelphia Lions Club, and president of the Philadelphia Golfers Association, as well as the Bala Golf Club, where he played with Mosconi and Snyder. He was a resident of South Philadelphia for nearly eight decades before moving in with his son in Roxborough. In November, he was honored with the Cesare Beccaria Award, given jointly by the Justinian Society and the Philadelphia Bar Association's Criminal Justice Section. In addition to his son, Mr. Rendine is survived by two grandchildren and two great-grandchildren. His wife died in 2006 at 94. A viewing will begin at 9:30 a.m. Tuesday, Jan. 6, at Immaculate Heart of Mary Church, 819 E. Cathedral Rd., followed by a Funeral Mass at 11. Interment will be at Holy Sepulchre Cemetery, Cheltenham. Donations may be made to the Juvenile Diabetes Research Foundation, 225 City Ave., Suite 104, Bala Cynwyd, Pa. 19004, or JDRF.org.